Church & Chapel Metal Arts saw a major increase in its business - despite competing in a very stable, mature category - after working with Thomas Keith & Associates to develop a new 68-page catalog strategically designed to provide customers with especially easy access to its best products. Chapco Carton Company's salespeople had a great story about their capabilities and quality people, but it took an industrial video from Thomas Keith & Associates to drive home the story in a memorable, credible fashion. 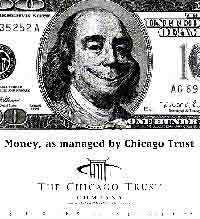 What separates The Chicago Trust Company from other money managers? Could it be Chemistry? Thomas Keith & Associates helped Chapco Carton Company introduce a revolutionary new way to market its quick-turnaround folding carton technology - incorporating traditional and multi-media advertising. When the folks at Simple Pleasures Light Low Fat Ice Cream started working with Thomas Keith & Associates, they had no idea that their tiny advertising budget could accomodate network television. Thomas Keith & Associates showed them how. This ad promotes NSC Technologies - providing contract research services for the food industry. If you're an R&D director for a food company, you'll understand the "dreaded project list." How would you want your money to feel about the way it's managed? In 1990, the leading product for people who had trouble digesting milk (lactose-intolerant) was LactAid. most lactose-intolerant individuals didn't realize they were lactose-intolerant. Most didn't even know what the term 'lactose' meant. Thus, a product whose name suggests 'aid with lactose' was completely irrelevant. they wanted to be able to drink milk, but didn't want to have to purchase a highly specialized product. they didn't want to have to buy a 'special' milk for only one family member. With Dean Foods, Thomas Keith developed Easy 2% lactose-reduced milk. a friendly name that clearly suggests 'easy to digest'. technological and production innovations to ensure a flavor virtually identical to other 2% milks. packaging, pricing and shelf position that reinforce the brand's 'real' milk, all-family positioning. Results? Same-store sales of five times that of the previous category leader.